Seeking to counter a deluge of anti-Israel ads in the Washington D.C. Metro, a group has paid to place several ads on D.C. busses asking the government to "Stop U.S. Aid for Palestinian Terrorism." The pro-Israel group StandWithUs (SWU) has paid for the ads to be featured on seven D.C. public busses that travel along the cherry blossom route most frequented by tourists seeking to view the spring floral display. SWU’s ads seek to counter a separate anti-Israel campaign by the American Muslims for Palestine (AMP), which is running its own Metro ads informing taxpayers dreading the April 15 deadline that their cash will fund U.S. aid to Israel. "We’re sweating April 15 so Israelis don’t have to!" states the AMP ads, which feature Uncle Sam waving an Israeli flag. "Stop U.S. aid to Israel’s occupation." The AMP ads are specifically targeted at those traveling along the popular cherry blossom route. Both SWU and the AMP have been running dueling ad campaigns for the past several years around this time. 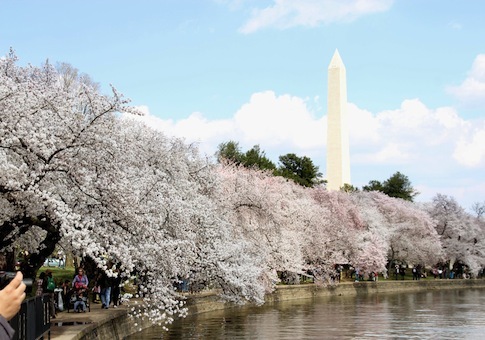 AMP stated in a press release that it "is using the beloved Cherry Blossom Festival to attract attention to its message: U.S. aid to Israel has got to stop." The SWU’s counter ads, which will run for the next month, direct viewers to sign an online petition advocating an end to U.S. aid for the Palestinian Authority, which the SWU dubs a terror organization. "The Palestinian Authority [PA] pays high salaries and good benefits to convicted terrorists in Israeli prisons," states the petition, titled No Taxes for Terror. "The more horrific the crime and the more Israelis or Americans murdered, the higher the salary and the better the benefits." "But where does the cash-strapped PA get the money for terrorists?" it asks. "Much of it comes from your tax dollars. The PA budget is heavily dependent on foreign aid—and the U.S. is the PA’s largest single country donor." The SWU petition demands that Congress condition all U.S. aid to the PA on its immediate cessation of terrorism. The billboard battle is part of a larger campaign between pro-Israel and pro-Palestinian forces, which have responded to calls for an end to Palestinian aid by targeting Israel, the United States’ closest ally in the region. Anti-Israel billboards have sprouted across the country since around 2007, prompting SWU to run its own counter campaign in areas such as San Francisco, New York, Houston, and elsewhere. "Anti-Israel groups continue to try to misinform the public in an attempt to erode American support for Israel," SWU CEO Ros Rothstein said in a statement. "They hope that well-meaning viewers will conclude that the U.S. should stop supporting Israel. As with all the anti-Israel campaigns we've encountered, context and facts are left out." Palestinian terrorists, many of whom are supported by the PA, have killed and injured hundred of Israelis in the past years and murdered nearly 60 Americans from 1993 to 2010, SWU notes on its No Taxes for Terror site. "Why would the Palestinian people support peace if they have powerful incentives to continue terrorism?" Rothstein said. "The Palestinian Authority clearly does not prepare its people for peace." This entry was posted in National Security and tagged Israel. Bookmark the permalink.